Wistman’s Wood – with its twisted, stunted, lichen-clad oaks and moss-strewn boulders – is no ordinary wood. 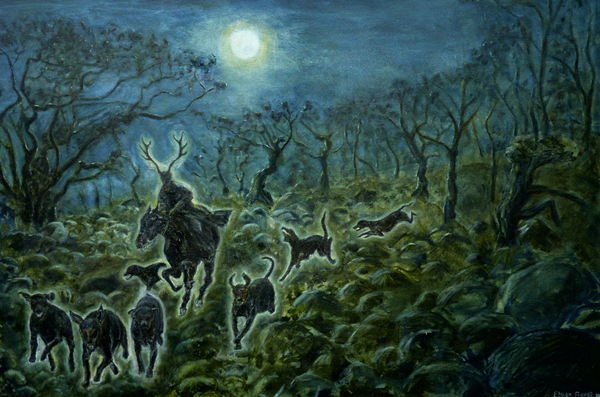 It is supposedly one of the most haunted places on Dartmoor, where the Wild Hunt is said to emerge at midnight, led by the Devil (known locally as Dewer) on his black horse and accompanied by the Wisht Hounds, a ferocious pack of phantom black dogs with fiery red eyes. Whoabetide anyone who crosses its path. According to legend, Lady Howard, a seventeenth century dignitary, was sentenced to spend eternity doing penance for murdering her four husbands . Her punishment is to journey across Dartmoor from Fitzford House,Tavistock (her ancestral family home) to Okehampton Castle in a coach made from her husbands’ bones. The carriage is driven by a headless coachman (in some versions the horses are also headless). 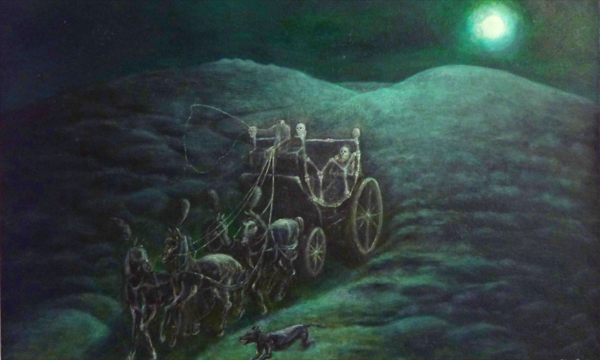 Lady Howard’s phantom is either seated in the coach or seen running beside it, in the form of a huge black dog with blood red eyes and savage fangs. On reaching the castle, she plucks a blade of grass and carries it back to Fitzford House, where it is laid upon a granite slab. Only once the grass has been completely removed from the castle grounds will Lady Howard be released from her penance and allowed to rest in peace. The Lych Way is an ancient road along which the dead were once carried for many a gruelling mile to be buried in Lydford cemetery. “Lych” comes from liches, Old English for corpse. Up until 1260 it was compulsory for the deceased to be laid to rest in their own parish churchyard. Lydford was at that time the largest parish in England, incorporating the Forest of Dartmoor, an ancient royal hunting ground that covered part of the moors. Thus, whenever somebody from Dartmoor’s isolated farms around Huccaby and Hexworthy died the coffin had to be carried for between twelve to eighteen miles, often in appalling weather. The journey was treacherous at the best of times, the mourners having to navigate at least eight bridgeless streams or rivers. 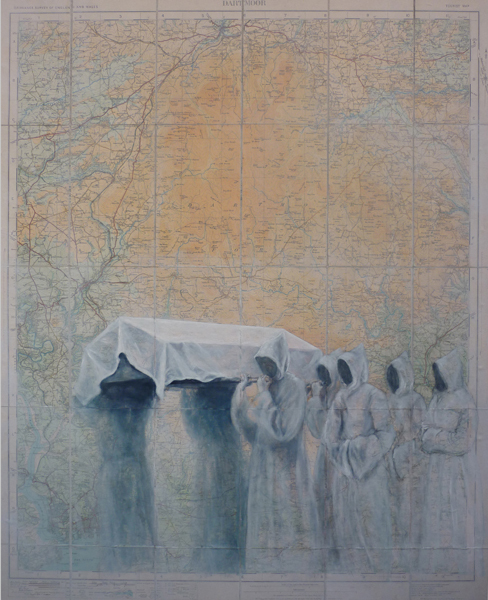 In more recent times there have been numerous sightings of phantom funeral processions and monks dressed in white threading their way through the mist along the Lych Way. Old Crockern is the guardian spirit of Dartmoor. In A Book of the West (1899), the Rev. Sabine Baring-Gould tells of a rich Lancashire man who had purchased thousands of acres of moorland and begun reclaiming it using the latest technology. One day he met an old moorman with a message for him. The warning was justified, the foolhardy businessman going bankrupt soon after. As for Old Crockern, not much else is known about him, except that on dark, stormy nights he emerges from Crockern Tor riding a skeletal horse. In my painting it is still daylight, but Old Crockern has begun to manifest, a night of haunting ahead of him.